WaitSuite uses “micro-moments”--extremely small intervals of time otherwise spent idle--to teach you new vocabulary words and test how far along you’ve gotten. What do you do while waiting for a reply to a chat message or your phone to connect to the WiFi? Instead of letting the old existential dread creep up on you again, you could be using that time to learn something. Like a new language. WaitSuite is a series of apps developed by the folks at MIT’s Computer Science and Artificial Intelligence Laboratory (CSAIL). It makes use of “micro-moments”–extremely small intervals of time otherwise spent idle–to widen your vocabulary in a new language and test how far along you’ve gotten. There are five specific daily tasks WaitSuite targets as part of its delightfully opportunistic didactic method. That includes when you’re waiting to connect to a WiFi network, an email or message to send, the elevator to arrive, or a page to load on your phone. Those might seem like tiny durations of time, but the team found that users learned about 57 new words in two weeks. That’s 57 more words than I’ve learned in the last two weeks, so I’ll take it. 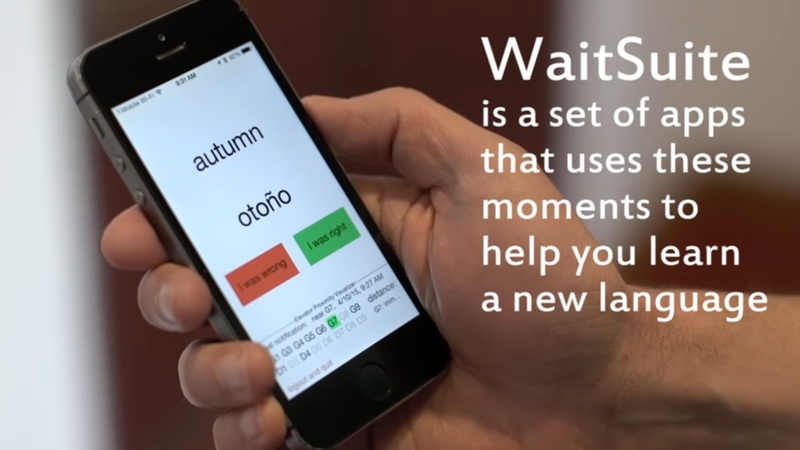 The app WaitSuite uses to teach language within instant messengers is called WaitChatter. It is available for free download as a Chrome extension off of the Chrome Web Store. WaitChatter is only compatible with GChat at the moment, so you will have to revert to it in case you’ve started using Hangouts. Once you’ve installed the extension, a box saying “Click to learn (Alt-J) ” appears under each chat box. Click it, and the app displays a word in English and a button that says “Reveal.” Clicking the button leads to either the Spanish or French equivalent of the word being displayed. You can choose which of those languages you want to learn by clicking on the extension’s icon in Chrome. Once WaitChatter shows you how to say a new word in Spanish or French, the app asks if you did or didn’t already know the word. It keeps track of the words you’ve encountered, so it knows which ones you’re in the process of learning and which are already inculcated into your vocabulary. That information will stick around in the browser as long as you don’t clear any hosted app data. The WaitSuite project was led by Carrie Cai, a Ph.D. student at MIT. Rob Miller, a professor at the College, and MIT alumna Anji Ren served as collaborators. The team plans on experimenting with different formats such as audio, as well as with other types of content like legal or medical terminology. Also, maybe the app should be called Wait Watcher. I’m just sayin’.